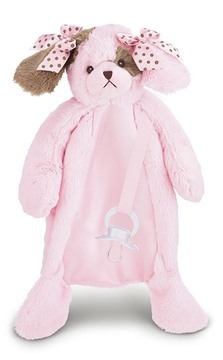 The Bearington Baby® Pacifier Pets combine a cuddly blankie with a pacifier holder. The animals are plush "fur" and lined with satin. They have satin bows at the neck or ears. They have a ribbon with velcro at the end to hold a pacifier. 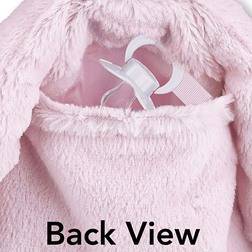 There is a pouch at the back that can hold a pacifier, burp cloth or other small items and closes with a velcro fastener. The face details are all embroidered. They are machine washable and dryable.